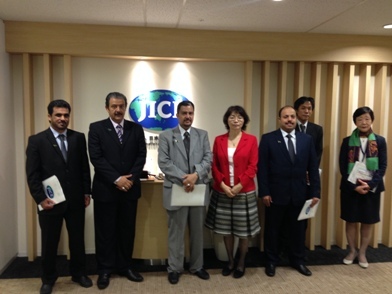 JICE received a delegation led by H.E. Dr. Majed Obed Al-Harabi, Deputy Minister of Education of the Kingdom of Saudi Arabia on September 16. Officials from the Ministry and the Cultural Office of the Royal Embassy of Saudi Arabia in Tokyo participated in the delegation, too. Ms. Masako Kishimoto, Vice President of JICE and the team of International Training Department welcomed them at its headquarters. Ms. Kishimoto started the meeting by expressing appreciation to H.E. Dr. Majed for his visit to JICE. She then talked about JICE’s activities and further cooperation between the Ministry and JICE. H.E. Dr. Majed expressed his expectation that JICE could support solving the challenging issues of the Ministry of Education of Saudi Arabia. JICE will continuously give effort to contribute to the human resource development programs of Saudi Arabia.